What do you get when you take an outlandish premise that every middle class American can relate to, mix it with a cast chock full of more diverse talent than any other comedy in recent memory (maybe of any film this year) and let them both free to wander where the wind takes them? 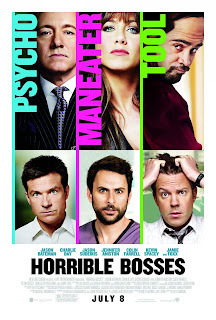 "Horrible Bosses" is a pretty good idea of what you would get. Fast paced, hilarious, and cleverly written this raunchy summer comedy is seemingly what we've been waiting for since "The Hangover Part II" turned out to be more rehash than genuine effort. We have been pretty lucky in the R-rated comedy department this summer; along with "Bridesmaids" and "Bad Teacher" (which I seemed to like more than most) and the other upcoming Bateman film which takes the whole body switching comedy to R-rated levels, "Horrible Bosses" just feels like the epitome of all this hard work for real, funny, raunchy comedies to be a constant. There is no longer a need to water things down to PG-13 to try and make a bigger profit. The studios are finally seeming to see that grown up comedies will appeal to just as wide an audience if not wider and let us thank the movie Gods for that because we would have been missing out on some of the biggest laughs this year had the makers of "Horrible Bosses" been asked to tame things down. Instead, our three leads including the king of dry one liners Jason Bateman and the dream duo that is Jason Sudeikis (SNL) and Charlie Day(It's Always Sunny in Philadelphia) who both co-starred in last years under-rated "Going the Distance" combine to form a trio of friends who take those hypothetical bar conversations and push them to epic proportions. Each of the three works under what are exaggerated characters of individuals with serious ego trips. Bateman, who works at some kind of big corporate firm is under the supervision of a menacing Kevin Spacey. 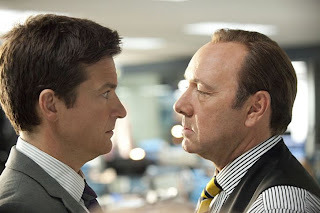 As Dave Harken, Spacey is probably the character who most lives up to the films title and is also the one who gets more screen time out of the three reasons our main characters are pushed to do what they feel is necessary. You will probably be surprised at how far they actually go with this plot especially including Harken and a few subplots that allow the film to round out its conclusion rather nicely if not a little smoother than it should have been. As for Sudeikis, he works at a chemical plant and loves his job and his boss (a nice little cameo from Donald Sutherland) that is until Sutherland suddenly keels over and leaves his coke head son Bobby in charge of the business. 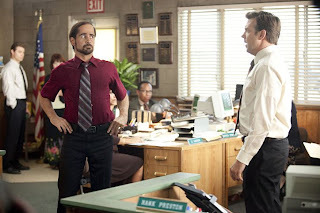 Bobby, as portrayed by Colin Farrell is the most outrageous of the bosses and is the one who goes criminally underused. Farrell totally transforms into this drugged out karate obsessed weirdo with the worlds worst comb over. He doesn't care to carry on the company his dad built a great legacy out of (that's Sudeikis' lot in life), no, Bobby only wants to squeeze as much money out of the place as he can and then head for the beaches. As for Charlie Day, clearly the breakout star here, his boss is certainly the least troubling, but it is fun to watch Jennifer Aniston go all against type and finally do something a little different than playing the girl who is looking for love. Here, she is just the girl looking for trouble. The whole flow and tone of the film is set from frame one as we are introduced to each of our main characters and subsequently their bosses. Director Seth Gordon who is probably best known for his debut documentary "King of Kong: A Fistful of Quarters" has lately been directing episodes of "The Office", "Modern Family", "Community" and "Parks & Rec" has certainly picked up on a few tricks of the trade from these great comedic sitcoms and helps this feature not to feel so broad that it gives into its outlandish premise but instead focuses in on the camaraderie his three leading men share and it plays to those strengths. throwing Jamie Foxx in the mix as a stereotypical African American who promises the guys he can help with their murder plans doesn't hurt either. As Dean "Motherfu*#$" Jones, Foxx only has a few scenes, but Like Farrell and Aniston they give such a strong impression it is unavoidable that you ultimately want more of the film. In fact, if I were to make one strong complaint about the film it would be about how easily everything gets wrapped up at the end and how quickly. I didn't want to stop hanging out with these guys and that is the strongest weapon in a comedy directors arsenal: to have characters you want to hang out with and see succeed. "Horrible Bosses" accomplishes that to the fullest. 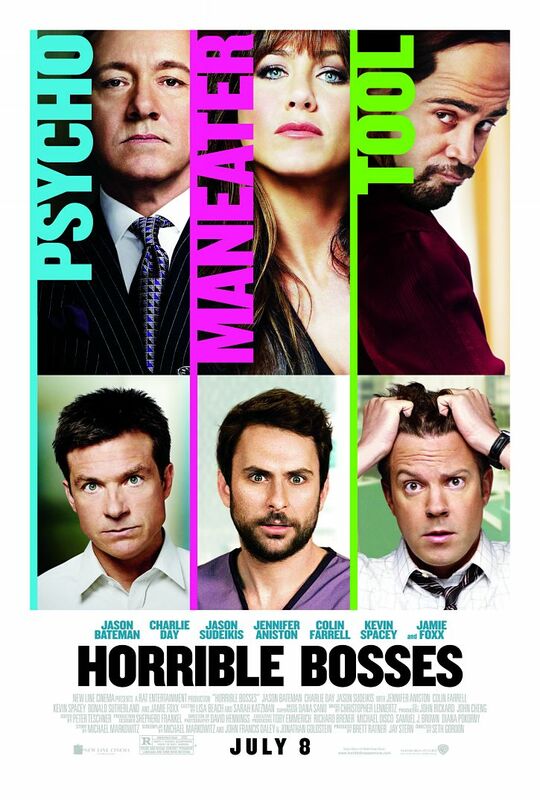 In all honesty it kind of feels like "Horrible Bosses" may be that breakout comedy of the summer. Where "Bridemaids" has commanded the attention for women comedians and given them a strong showing, "Horrible Bosses" has matched it with the classic mans man comedy. An almost flashback to the 80's when R-rated comedies were all you would expect from the top comedians in Hollywood. I am so glad we are going back towards that, now, almost in full swing. Everyone involved here deserves kudos for branching out but without the way Bateman can deliver those simple lines and turn them into comedy gold or the way Sudeikis fully embodies this wannabe smooth talker that's attractive enough to get the girls but still socially inappropriate to Day's star making turn with his shrill-voiced, spastic antics and delivery this movie would not have come close to reaching the heights of which it has. This is comedy gold in my books and I enjoyed every minute of it. Leave the kids at home, if you haven't been to the theater in a while take a night off and go see this with a big crowd and enjoy the huge bursts of laughter this film will keep rolling out.